While butterflies flap their fragile wings across the globe and out of sheer chaos, like an artist with raw clay, shape our lives ever so slightly upon each flutter, distant, unseen reminders that every fragment of this universe is connected to all others at all times, and that events affecting us today were set in motion eons ago, Marie and I, at last, have landed in our new home. Could we have predicted it? Not a chance. Butterflies are shrouded with mystery, and so is chaos. It has been a hectic, traumatic summer to say the least. So when I manage to escape for a day and go fly, I admit doing so with a pervert mix of deeply rooted guilt and pure ecstasy. 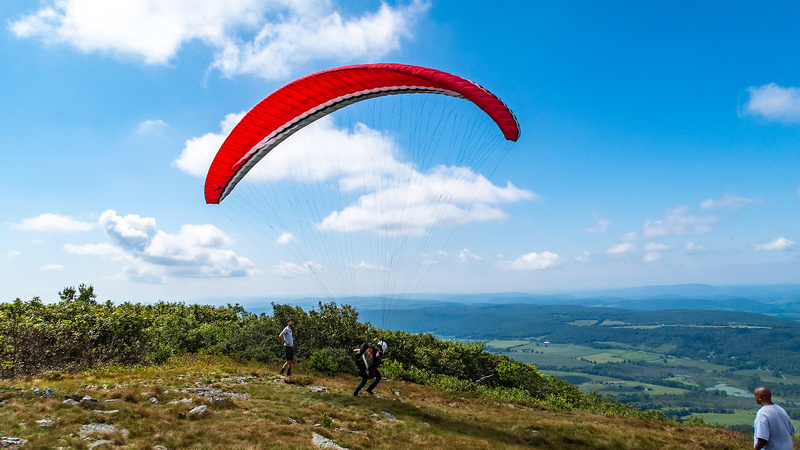 Following a much needed refresher in Ellenville back in July under my old Swing Arcus, I have now managed to fly the new Iota 2 twice at Brace Mountain near Millerton, NY. 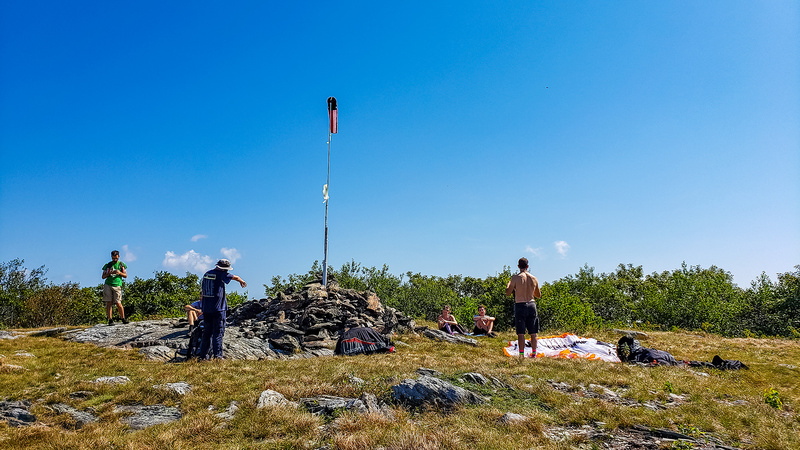 The launch site is on a State Park and the Mount Brace Outdoor Club operates there under an agreement with park authorities. 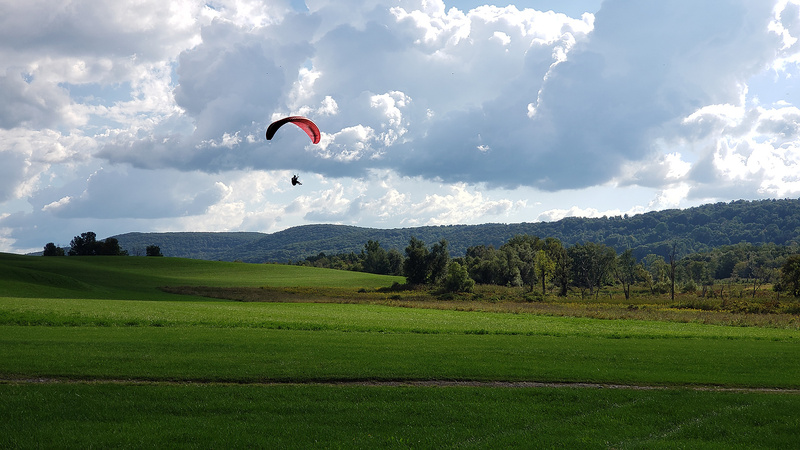 The LZ is a beautifully open, cleanly mowed private field flanked by a farmhouse and a few trailers where the lucky few spend their summer weekends barbecuing in close proximity to the sky, in a state of daily airborne readiness. 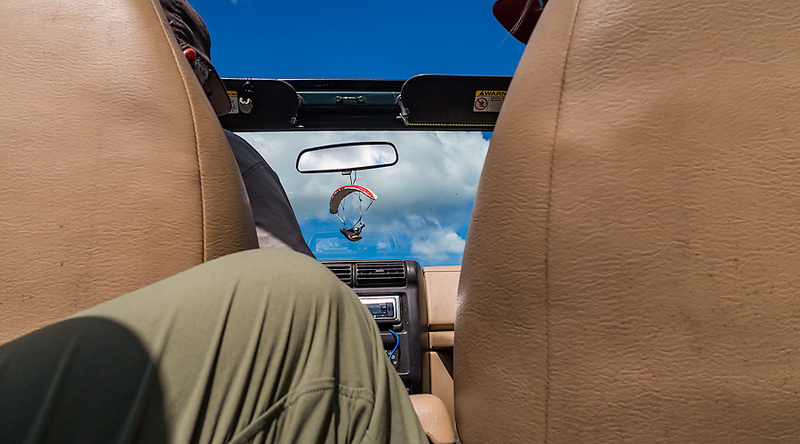 Flying at Brace, however, requires a solid dose of commitment and the generosity of those who have larger vehicles with off-road stamina. 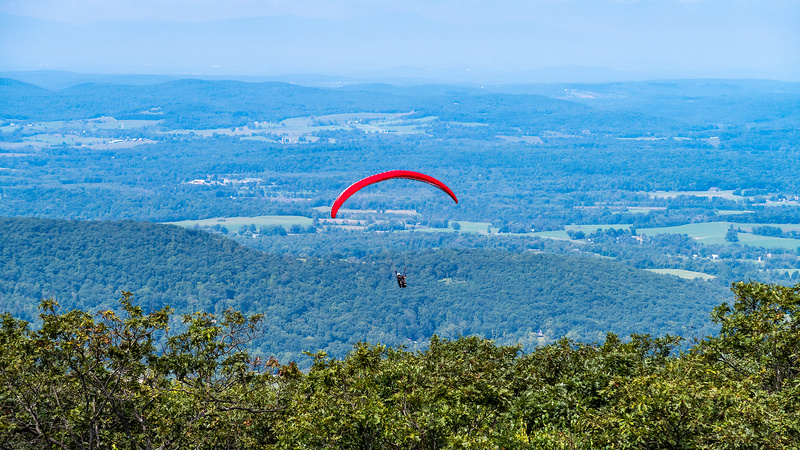 While the take off area is directly above the LZ in a straight line and some fifteen hundred feet higher, a thirty minute drive around the mountain is needed to get to the bottom of a trail, which then leads up to the summit in another thirty minutes or so. 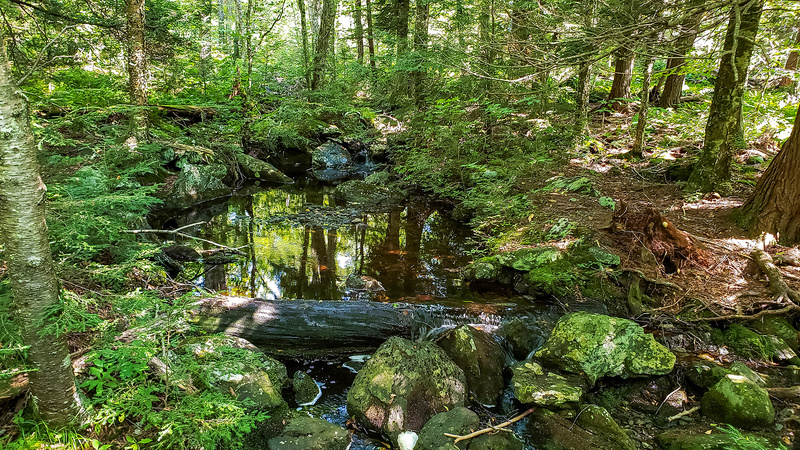 It is a beautiful hike—despite the heat of summer days, very little wind on the leeward slope and the friendly forty pounds of gear on one’s back. Although rare in the Northeast, rattle snakes are often seen there, but I have yet to spot one. Up at launch, the ambiance is dictated by seasons, the caprices of weather and a lot of micro-variables such as time of day and calendar events. 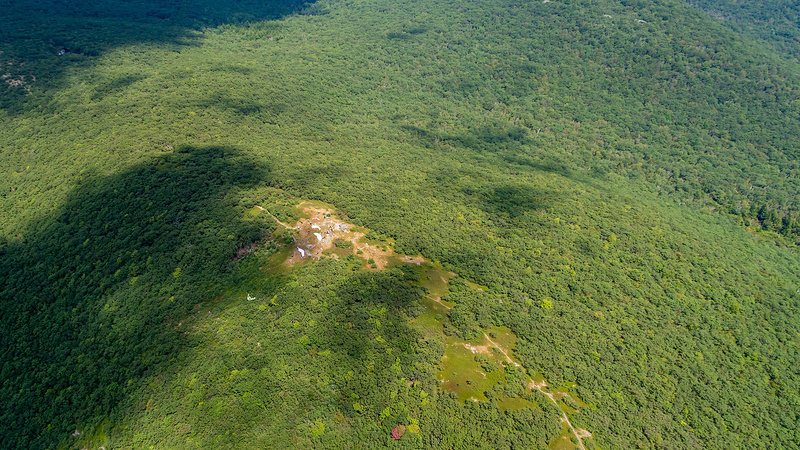 On my first visit, having driven around with a group of jovial Brazilians, I found the top of the mountain bustling with activity as many pilots, their escorts and random hikers gathered in the clearing that serves as a launch pad. There would be dozens of wings aloft eventually that day. It was my very first flight under my new Advance canopy and it went well. Someone posted a Youtube video of that day’s flying and I am seen launching somewhere in the beginning, then a couple of times in flight above him. Thermals were well behaved, easy to find and center, and I took my time getting familiar with the site. 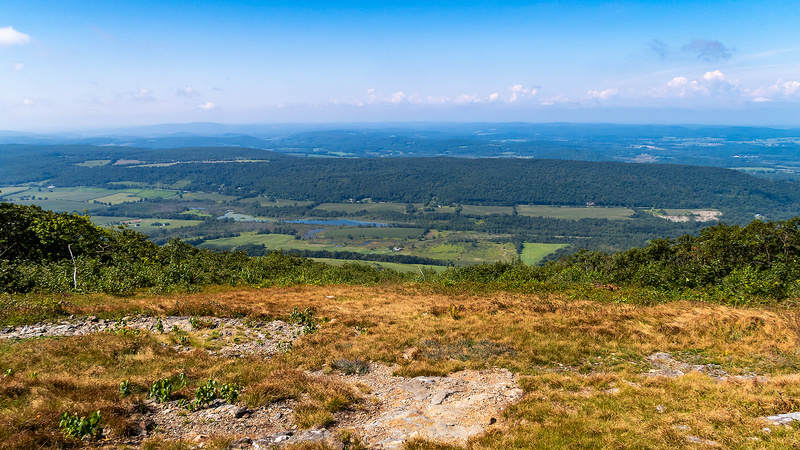 At my feet, three of the original Thirteen Colonies huddled in a tight corner: New York, widely spread out to the west along the ridge, Massachusetts behind me to the east and Connecticut to the south. Drifting slightly downwind as I ascended in circles, I could actually visit all three States within a single turn. Then a few weekends ago, having taken a chance and driven up from the city despite a marginal forecast while Marie was visiting Ohio, I found the LZ deserted. About to bail, I ran into a couple emerging from a trailer and who offered me a ride up, having gauged conditions at the top through a telescope and found them worth the gamble. 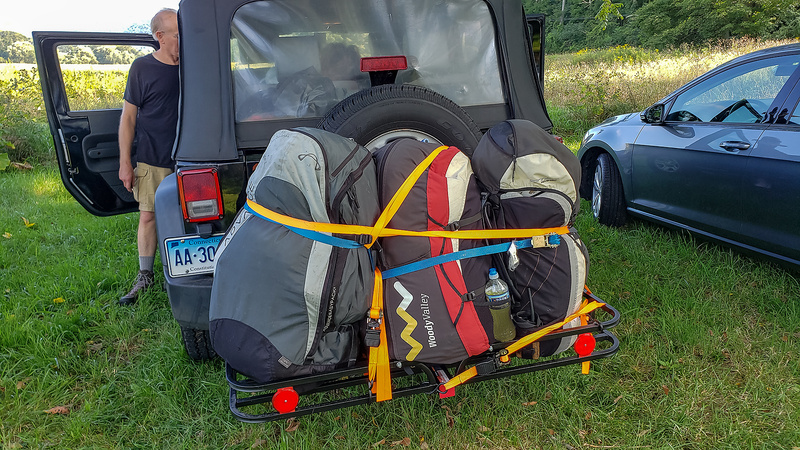 They threw some stuff out of their two-seat Jeep, awarded me a cushion so that I could wedge myself between paraglider bags in the back, and instructed that I duck out of sight if we met troopers. And off we went. Bill, his wife and I, having hurried around the mountain, hiked up at record speed and found the top utterly empty. Eating a bar and drinking water, I caught my breath and scanned the world. Weak easterly winds were blowing contrary to launch but mild thermals were already triggering in front as it was around two o’clock, and they hugged the slope towards us, generating just enough headwind for a perfect take off. 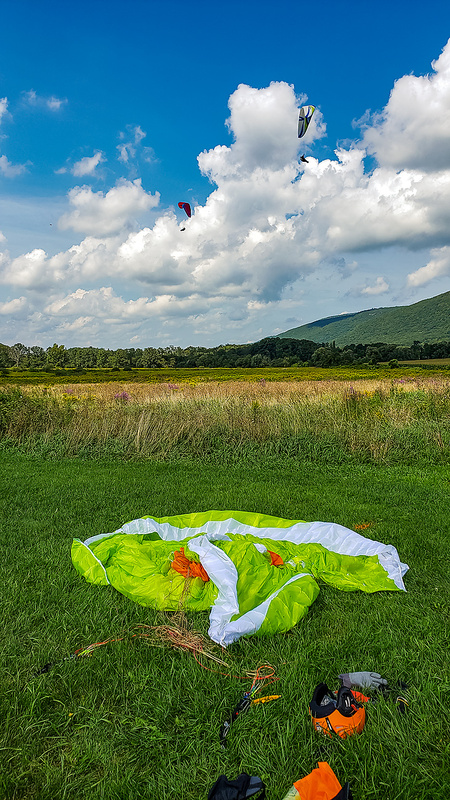 We setup quickly, enjoying the wide open space to ourselves—much easier than when there are ten or fifteen eager pilots all wanting to get airborne. I was ready first and as we had agreed that on such a day, waiting longer for stronger conditions would not necessarily pay off, I launched. Things were definitely mellow. Turning immediately, I hugged the slope for a while, scratching to find weak lift here and there. I soared back and forth the best I could, never able to climb back much higher than my take off altitude. Bill had a failed launch behind me and by the time he was ready again, a large cloud overhead was weakening convective activity and he decided to sit tight and wait. Finding the slope too inhospitable, I headed out into the valley towards the LZ, hoping to find better conditions up ahead. There were a few thermals triggering from houses or darker fields, and I used them the best I could, but it was hard work for a very shy vario. The Iota 2 did brilliantly though, letting me cash in on every little bit of lift. About half an hour into the flight, as I was getting low and planning my approach, I noticed a large number of raptors circling in the distance. They were upwind from the field—and given my low altitude, just on the edge of safe range—but I took a chance and speeded towards them. It was what cross country pilots call a “low save”. The thermal was good for that day and I circled up along with the birds for a while, so focused on my flying that in retrospect, I realize I completely failed to identify their specie. But we all eyed each another expectantly, seeking clues to the best lift and eager to prove our aerial supremacy. It is a duel I have never won against feathers. The cloud above was turning a bit dark and still pinning Bill to the ground, and when I felt a few drops on my cheeks, I decided it was time to land. 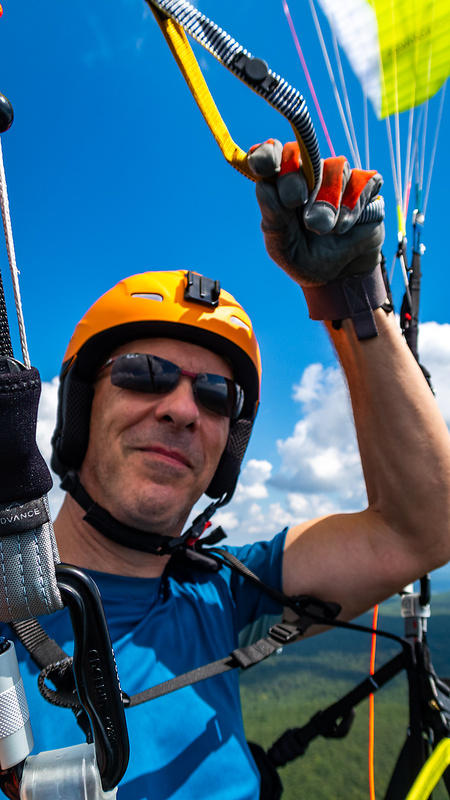 Pulling in the big ears*, more as a playful test of the maneuver and the wing’s response than anything else, I plunged into my downwind leg, turned into base, released the ears, turned final and landed at the deserted LZ. I bunched up my wing and took it to a corner to fold it. Finishing my packing, I noticed a red glider on final. It was Bill who had finally taken off, letting his wife hike back down and drive the Jeep around, but the conditions had never picked up and he had to content himself with a short sled ride. Bill and I shook hands, glad to have flown despite unlikely circumstances, then we discussed canopies, varios and aerology, and finally called it a day. 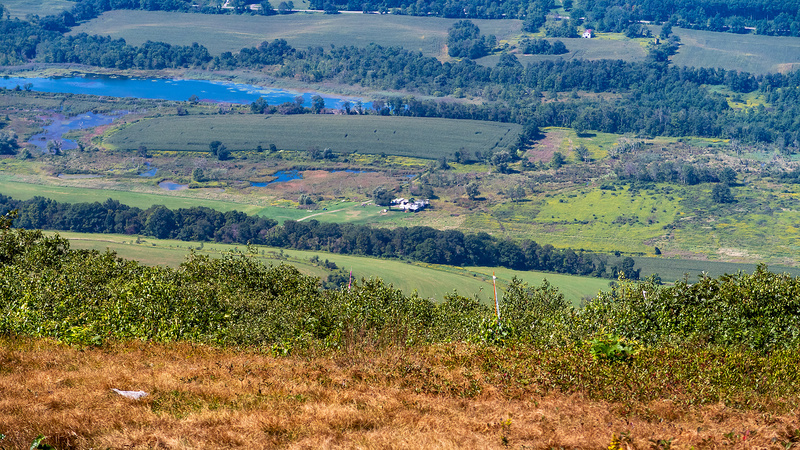 I hopped into Ntiniwe and headed back to the Big Apple, a hundred miles south, through a lush landscape of luxuriant fields and the rolling Taconic Mountains. My Iota 2 rocks. I am still getting used to the glider but I already know I’m sold. 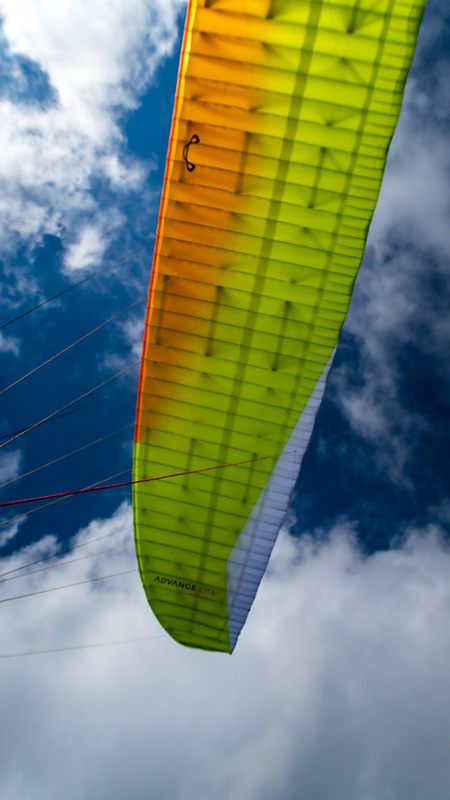 Comfortable and reassuring yet tight and performant, minimalist but it’s all there, impeccable design and craftsmanship, the wing is a beauty. * Big ears: A descent technique consisting of intentionally collapsing both wing tips by pulling down on the outside-most lines, effectively reducing the wing’s area and thus its lift, and inducing parasite drag.